The perfect time to talk about nutrient density and the value of food is when emotions and cravings are low. I find the first two phases of eating — the non-eating and preparation phase of eating — are excellent times to chat about food. These phases can be when you go grocery shopping. Consider letting your kid loose with a smartphone and together discover healthier options! If that isn’t possible, make a game of shopping! Ask them to find a cereal or bread they would try that has 3 grams of fiber. Find a yogurt that they will try that has less than 20 grams of carbohydrates. As you can see, calories are a tiny part of the nutrition puzzle. Nutrition is part of a bigger puzzle of health, which is part of the biggest one of all, the family, love, and happiness puzzle! So what is the real value of calories? As with money, parents want their child to know more than the difference between a nickel and a quarter. Teaching your child to focus on identifying just higher- or lower-calorie foods is similar to teaching your child to identify only quarters and nickels. It does not teach your child the VALUE of quarters and nickels. Teaching your child the value of money is a far more complex goal. In addition, the value of money is influenced by many factors, including your view of money and its value to you. The same is true for nutrition. The value of eating a balanced diet is influenced by many factors, including your own experiences, your time, your energy, and how much you value nutrition. Mindful Eating for Kids begins by creating a culture that represents your nutrition values. Explore your values with your child by using the four phases of Discover, Explore, Play, and Challenge. This format helps parents instinctively select the phase that would work for their family. There is no pushing, arguing, or food fights with eating. These have been replaced with the intention to talk about what the parent and child value. This teaching method doesn’t offer a quick fix or claim to work in 3 easy steps! What Mindful Eating does is help explore a deeper understanding of nutrition that aligns with your family’s values. Have fun and enjoy shifting your nutrition conversations to help the entire family eat and enjoy nutritious meals and snacks! Sign up for Mindful Eating for Kids today! Many parents feel, “My child needs to eat better.” Society, unfortunately, has a knee-jerk reaction and assumes that “eat better” is synonymous with “cut back on calories.” As you just learned in the previous post, this lacks critical understanding: Calories do not represent nutrients! Focusing solely on calories is a doorway to disordered thinking and eating. How can this be? Many children say to me, “I love cookies, and my mom says we can’t have them!” I reply, “You enjoy eating cookies, and giving them up or not having them makes you sad. It feels like punishment. It feels like your mom is only concerned about calories and not your happiness.” This reflection often generates a nod in agreement, and a new sense that the underlying conflict and underlying fear is starting to be understood. When kids and parents open up and discuss what they value — health, nutrient density, enjoyment, fun, and discovery — there is a shift in how to view nutrition. It moves from a single-focus concept to something much more workable. This shift allows the child to hear the love and concern that is in a parent’s heart while letting the parent hear the fear and sense of deprivation that comes from rapid or rigid dietary change. Unfortunately, parents are not offered a sane way to deal with normal cravings and desires around food. Kids don’t remember the complex concept of nutrient density when they are really hungry or faced with tempting choices. Even if there was the coolest phone app in the whole world available, when hunger or craving is present, it is challenging to make a “good” food choice. This is why healthy professionals like myself love Mindful Eating. Mindfulness helps parent pause to see the BIG picture. What do I mean? When your kid wants to eat junkie food, pause and learn how hungry they are. 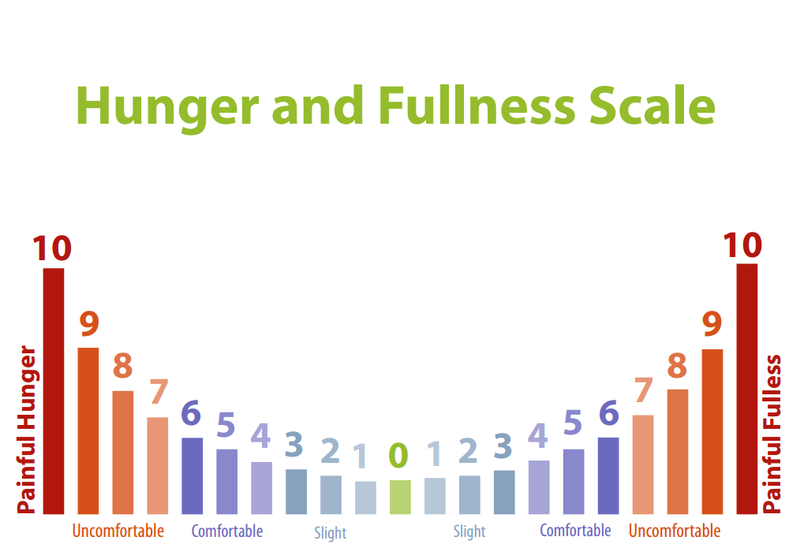 [Hunger rating scales]. The hunger-rating scale above offers visual and color cues to help evaluate this experience. 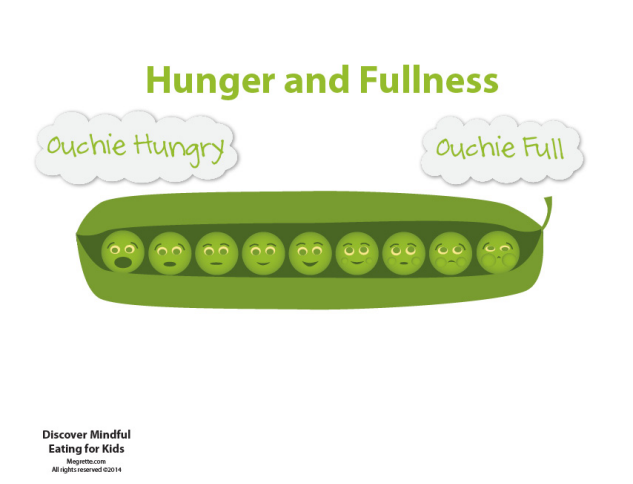 If you are working with a younger child, consider using the Hunger/Fullness Peas scale. Including an assessment of hunger will allow you to have a more complex discussion. If your kid is “starving” and has identified hunger as any number in red, explain that eating 1-2 cookies wouldn’t make a dent in his hunger and that he needs real food, i.e., something with protein and fiber. If he looks at you with those sad eyes and says, “My day was terrible! I need these cookies,” you have an opportunity to help him sort out how to soothe his feelings without using food. Rating hunger will help you explore “why” is my kid choosing to eat “that” food? Or “that” amount? Checking in with your child’s hunger is an excellent way to help him know you are thinking about him and his experience. Taking time to listen to your child is nourishing the bonds between parent and child. It is in direct opposition to the tabloid lists of “to-do” that seem so easy but accomplish so little. It is hard to parent. The websites The Family Meal Project, Ellyn Satter and Associates, and How To Raise Healthy Eaters offer parents great information, ideas, and suggestions about nutrition — not lists of “just” and “only” suggestions that make parenting a frustrating kid seem easy! In the next post, we will explore when to talk about nutrition and calories to your child. Join me as we identify ideas, interesting concepts, and engaging ways to talk with your kids about what matters most about nutrition — your family values! There are more great ideas for parents on how to promote sustainable change and balanced eating. Sign up for Mindful Eating for Kids today! Society has created a lot of unfortunate emotions and assumptions regarding calories. These emotions seem to be centered on the confusion when looking at two 100-calorie products: a pack of nuts and an ice cream sandwich. The calories of these two foods are equal. However, the nutritional value of these two foods is very different. Therefore, knowing what the calories are, doesn’t help you or your kids understand the nutrients that food offers. This confusion can become downright misleading when the focus is on ONLY the amount of calories in food. When a parent or professional starts down the road of valuing only the number of calories a product has, they promote food judgment. Resist the desire to defend the idea that the amount of calories makes a food good or bad, and remember back to what a calorie is — a measure of energy. Calories can’t be judged in isolation, they are only a tiny part of this “whole” called nutrition. Calories are just a piece of a much larger conversation. Calories can help you explore and understand your values. Ask yourself, does this food provide a good value for the number of calories it offers? This question, “Is it a good value?” is an important but seldom discussed nutritional concept called nutrient density. Nutrient Density is a comparison between the amount of nutrients a product has available per calorie. Gratefully, there are helpful tools available if you are willing to ask yourself, “What could I do to improve the nutrient density of the foods already in our diet?” For instance, smartphones offer helpful apps such as FOODUCATE. Also, algorithms that supermarkets use, such as Guiding Stars, help shoppers choose higher-nutrient foods. Simple questions that can improve the nutrient quality of a meal include, “Can I add fruits and vegetables? Could I add whole grains?” If you are feeling a bit timid at the idea of increasing the nutrient quality of your diet, remember that registered dietitians and nutritionists now work in supermarkets and are a fabulous resource! The good news is that when teaching your kids about nutrition, smartphone apps, and point-of-purchase systems can help you make a healthier food choice. When families open up the conversation to family values, the discussion typically includes eating and enjoying nutritious meals. This means that the conversation also has to include nutrient desire. What is Nutrient Desire? It is a term I coined that evaluates the nutrients in food and how much a person desires eating it. Using kale as an example, it may be loaded with nutrient density, but most kids report a low nutrient desire! When both of these values are included in a conversation, there is a huge shift identifying solutions and the speed at which they can be implemented. Parents have to be not only clever about bringing more nutrient-dense foods into the diet, but also patient about introducing those changes. They sometimes will have to move at a glacial pace! Cleverness and patience are two aspects of change I believe are critical for families! The Parents can no longer make a foul-smelling, brown-colored breakfast shake and expect their kids to be willing drink it because “it’s healthy.” They might think back to their own childhoods and recall that nutrient-dense foods were offered without discussion. Now we know that fear of new foods is wired into the brain and that being forced to take care of the body by eating foods “because they are good for you!” breeds resentment and a strong desire to not eat healthy food. When a parent forces a child to eat nutrient-dense foods, they create the conditions for a food struggle. This struggle can quickly become a fight, a war, and ultimately a stalemate when, twenty years from now, he remembers back to childhood and thinks, “I wouldn’t eat it then, I won’t eat it now!” This stubborn resistance began when parents valued low-calorie, nutrient-dense foods over taste, enjoyment, nutrient desire, choice, and ultimately, the child’s own preference. Parents feel they need to provide their families with nutritious meals, which is something that I, too, value and share as a parental goal. However, I also know that one food, one meal, one week does not make a diet “nutritious.” Changing your families diet is a slow, deliberate process. Mindful Eating for Kids explains that change begins with a “dot” or one attempt at something new. This “dot” is how a kid Discovers! The Dot represents a child learning something new. Kids are interested in learning, so discovering with your kids is natural and often effortless. Once you discover something — say, that your child like strawberries — you can Explore with your child all the other meals that include strawberries. This could range from yogurt to shakes to strawberries on a salad. The options are endless! After you explore, make an effort to Play and bring the fun into your family’s food, eating, meals! The Explore and Play phases are a series of little changes that provide parents with an opportunity to deepen their knowledge of their child’s food likes, dislikes, and limits. It provides the necessary information for a parent to adapt, modify, and change things up, learning the limits and edges of their child’s willingness to eat specific foods. Once that has been identified, it is time to move to the “Challenge” phase, where small adventures promote change and push these edges. These can range from meal planning, cooking, eating 1, 2, 3 nutrient-dense foods or more in a day. The “Challenge” phase is often completed during short time-limited “games” that you can play and enjoy talking about with your kid. These four phases — Discover, Explore, Play, and Challenge — are the heart of Mindful Eating for Kids. This format helps parents instinctively select the phase that would work for their family. There is no pushing, arguing, or food fights with eating. These have been replaced with the intention to talk about what the parent and child value. In the next post we will keep exploring how and when to talk about calories to your children. Join me as we identify ideas, interesting concepts, and engaging ways to talk with your kids about what matters most about nutrition — your family values! Sign up for Mindful Eating for Kids and never miss another post! Now that you know what a carbohydrate is, the role of fiber in promoting balanced energy and health, and how food processing changes the nutrient density of food, you are wondering how to put it all together! Keep in mind that most foods are processed, so avoiding all processed foods may not be possible or practical because life gets busy and doesn’t always follow our best plan. What to do? Mindful eating is very focused on behavior. It asks you to shift your focus from achieving a specific outcome to how much effort a behavior takes. To help your children understand effort, you will need to create an effective way to communicate the concept of effort, not just for the child but also for yourself. The tool that I have found the most effective to evaluate and communicate effort is the red, yellow and green effort gauge, which is pictured in above. Show this to your child and explain what each color means. Red = a lot of effort. You might be able to be in the red for a short time. Staying in the red for a long time is hard and often painful. Staying in the red zone is a short-term, temporary change. Yellow = is a moderate amount of effort. You would be able to stay in the yellow for a very long time. The yellow zone is a balance of effort and comfort, a place where you feel as if you are working, changing, making progress. Green = is a very easy amount of effort. You would be able to stay in the green zone forever, but nothing would get done, nothing would change. The green zone can often become so easy, you might feel lazy or even bored. If your children want processed foods instead of less-processed foods, I can empathize. Like every parent, I have had that day, week or month when dinnertime harmony is an essential nutrient! Like you, I wanted to serve the lower-nutrient, more processed comfort foods to avoid a food fight! What to do then? The mindful eating perspective takes a step back. Ask yourself, how much effort can I give to changing my family’s diet? You want to identify tips and cooking hacks that will keep you in the yellow zone. Avoid diets, ideas and hacks that you think will put you in the red zone. If you find a change that was easy to make, and you are thinking, I am in the green zone, step up your game and do more to move back into the yellow zone. Remember the yellow zone is a balance between effort and comfort! There are many reasons changing your family diet is challenging. This is why Discover Mindful Eating for Kids has a four-part change format: Discover, Explore, Play and Challenge. Start each idea for change in the Discover mode! Since we are talking about carbohydrates, fiber, and eating foods that are less processed, I suggest starting to discover as much as you can about these three topics. You might even spend time reading about different types of carbohydrate foods, such as ancient grains or exotic fruits, and exploring different types of milk, from cow’s milk to nondairy products, including soy, rice, almond and hemp milk. In the Discover phase, you need to give yourself permission to learn! You can discover if there are less-processed alternatives to your favorite “junk” foods. You can also learn more about fiber in your family’s diet, reading labels or trying a new food app, like Fooducate, to help you learn about more food options. Now move to the Explore phase. Maybe purchase different whole grain breads and cereals and see if you like any of them. Purchase an ancient grain or exotic fruit, make a few recipes, and really kick the tires of this dietary change. You haven’t committed to anything; you are just narrowing your choices and really exploring your options! Here is our story about 5-grain cereal. My oldest daughter is more adventurous with food than most kids. We were shopping, and she wanted to purchase frozen 5-grain cereal. I said sure. We got it, and she really liked eating it for breakfast. It was yummy, and filling, but it was sold in a store that is far from our house and it was also very expensive. We “Discovered” that 5-grain hot cereal was a great breakfast option, but we needed to “Explore” alternatives because the availability and cost just weren’t working for our family. I was sharing this story with a friend, who said, “I have a recipe. We make that all the time at home. We soak the grains overnight and make a pot on Sunday. Then we keep it in the fridge and eat it throughout the week.” I talked to my daughter, who loved the idea. We purchased the ingredients, and one winter, we had this 5-grain cereal almost every morning! We “Played” with each batch, trying different grains, adding nuts and fruit, topping it with yogurt or different types of milk. Then spring arrived, and hot cereal wasn’t really what we wanted. Soon our 5-grain cereal was forgotten. The next winter came, and I kept hinting to my daughter to start making our satisfying hot breakfast again. She was busy, things got in the way of her cooking, and I could see we had fallen into the typical breakfast rut. I mentioned again the joy of our hot cereal breakfast, and she said, “Mom, that is too much effort for me to make it in the morning.” I knew my daughter was in the red zone. I challenged myself to step up and get out of my comfortable green zone and make this hot cereal. When I did, my daughter was so grateful for the new breakfast option, but she did mention that her recipe was better than mine. We laughed, and the 5-cereal breakfast challenge was on! I played with the recipe to find the combinations of grains, fruits, and nuts we liked the best. This story shows that changing your family’s diet isn’t something that just happens. Take the slow approach, change at a rate that keeps you in the yellow zone, and remember it is helpful to follow a format that allows you to Discover, Explore, Play and Challenge yourself. Please remember to sign up for Mindful Eating for Kids email newsletter! What exactly is a processed carb? If you have ever asked that question, then keep reading because I would like to talk about processed carbohydrates to try to clear up some of the confusion about this term. To begin, a processed food is any food that has been changed from its natural state. The act of processing can both enhance digestion and improve the taste. In varying degrees, it can reduce the amount of nutrients a food contains. In recent years, processed foods have come under attack. You might have heard about diets that encourage consumers to engage in “raw” or “clean” eating. These plans focus on how much a food is processed or the amount of additives a product contains. To understand what a processed food is, let’s look at making orange juice. The first step is picking the orange. This is the raw ingredient. In this state, the orange, freshly picked, has the most amount of nutrients. Then the orange is squeezed. One orange typically makes 2 ounces of juice. For juice, the fiber-rich pulp and membranes are discarded. This is the first place where we see the nutritional value decrease. The fiber-rich orange is now a 2-ounce glass of fiber-less juice. If you would like to drink more than 2 ounces of juice, you would have to squeeze another orange. In this example, the number of calories in juice is twice as much as an orange, because you need two oranges to make a single glass of juice. This is an example of how processing can add calories to a food. When orange juice is made commercially, the juice might go through a process of heating – which is pasteurization to eliminate unwanted bacteria – or freezing to preserve or concentrate it by removing the water for more efficient shipping. Many manufacturers strive to create a very consistent product, so they may add carbohydrates to a juice by blending in other fruit or juice or adding sugar. This step changes the amount of carbohydrates in juice and, depending on the other juice added, may decrease the overall amount of vitamins. Processing is not bad. However, consider the amount of processed food you are eating. Most people will process carbohydrates by cooking them. Looking at how you process a potato can help. Imagine I just baked a potato, keeping the skin on and just popping it in the oven. This is an example of very little processing. If I boil and peel the same potato, I have removed the fiber-rich skin and, through the boiling process, removed a few vitamins and minerals. If I mash the cooked potatoes and add milk and butter, other macronutrients, namely fat, have been added to the potato. The problem with processing is that other macronutrients, especially fat, are typically added, or other nutrients are removed. Adding other macronutrients to a food is not bad or harmful, but it does change the nutrient density of a food. Nutrient density is a tricky concept to understand and even harder to explain to your child. This is where using an analogy is helpful. When you purchase any item, you need to understand two concepts: its cost and value. When we look at food, the cost is equal to the calories and the value is the nutrients it contains. How a food is processed will affect both its cost and the value. Nutrient density is comparing the cost (amount of calories) to the value (amount of nutrient) a food has. A “smart” choice has a lot of value for the cost. This is same for food. If a food is considered nutrient-dense, it has a lot of nutrients per calories. For example, potatoes have a lot of nutrition per calorie. However, when you process potatoes into potato chips, you change this ratio. If you are wondering, did the frying of the potatoes remove the nutrients? It didn’t, but the frying did add a lot of calories (over 100 per serving), lowering the amount of nutrients that chips have per calorie. Using the money example above, the calorie cost of the potato nearly doubled and went from 80 kcal to 150 kcal per 100g serving. Not only did the cost of the chips go up, but there was also a decrease in the value (because potato chips don’t have the fiber-rich skin!). Understanding nutrient density is an important concept to share with your children. You can do this very easily by using smartphone apps that calculate this equation. My personal favorite is Fooducate. I like this app for a number of reasons, including that the rating is a simple letter grade, ranging from A (very nutrient-dense) to F (very low nutrient density). It offers alternative food choice and an explanation of why a food received a specific rating. However, the real benefit of this phone app is it’s a teaching tool, not another calorie tracker or food diary. I strongly discourage parents from keeping track of their child’s food and eating unless it is medically necessary. Please remember to sign up for Mindful Eating for Kids newsletter!